The very first time in history we have the published words of the deaf is in 18th-century France: a letter by Saboureux de Fontenay in 1768 and in 1779 a book written by the bookbinder Pierre Desloges, part autobiography, part a defence of signing. The essential context for Desloges's book was the controversy over the status of sign language. Though fundamental to deaf pedagogy, the issue drew a wider audience, relating as it did to the nature of language itself. The abbé de l'Épée became a well-known figure in 1770s and 1780s when he gave public lessons before an array of distinguished philosophers and scientists. De l'Épée was an early champion of signing which he saw as the "maternal language" of the deaf; the role of the instructor was to learn the natural language of signs himself, then to teach his pupils how to "translate" their natural idiom into written and finally spoken French. His posthumously published Dictionary was not, as one might expect, a compendium of signs but a book of explanations intended to build on an existing vocabulary. In his lessons he himself was a "living Dictionary" interpreting the meaning of words through "methodical signs artistically combined". This approach was open to attack because of its lack of precision, but was almost universally approved, then as now, by the deaf community. The debate over signing fed easily into philosophical quests for a universal "natural language" which became topical in the 1760s. De l'Épée himself entertained the fantasy of erecting sign language into a global idiom, with accompanying reversion to the Christian values of honesty, simplicity and directness. In 1775 Condillac in the first volume of his Cours d'études, offered a theory of the origin of language and a method for teaching grammar, both of which were grounded in a language d'action a along the lines of the abbé's "methodical signing". Among the deaf, however, there were dissenting voices. Jacob Pereira and his deaf student Saboureux de Fontenay argued for the greater efficacy of dactylologie (finger spelling) to articulate French words. So too Desloges's adversary, the abbé Deschamps, a teacher of the deaf in Orléans, who felt that signing offered limited comprehension of ideas and saw the difference between men and animals as resting essentially in "la parole". In the 1770s the abbé Alexis Copineau, canon of the church of St.Louis du Louvre and a friend of de l'Épée,took over the defence of signing for the deaf; he championed the idea of a "mimic language" which could be developed along the lines of signing as a meta-language. It was in all probability Copineau who ghosted, or at least heavily edited, Desloges's Observations, which was published by his associate, the Jansenist bookseller,Benoît Morin. The basic theme of Desloges's book was superiority of signing - and the abbé de l'Épée's "methodical signing" in particular. For Desloges, signing was the natural idiom of the deaf, as he has it "my own language". Moreover, with Copineau he claimed that signing is actually preferable to verbal communication and should be learned by all. .The two accidents of deafness and mutism occurred at the same time and, so to speak, without my realizing it. During my illness, which lasted nearly two years, my lips became so slack that I can close them only with great effort or the assistance of my hand. In addition I lost all my teeth; it is chiefly to these two causes that I attribute my mutism. Beyond that, it happens that when I try to speak, air escapes and the sound I make is just inchoate. I can utter long words only with great hardship, by constantly breathing in new air which, again escaping, makes my pronunciation unintelligible to strangers. One can reproduce my speech fairly accurately by trying to speak with the mouth open, without closing lips or teeth. He relied on writing and a vestigial ability to speak until the age of twenty seven when he learned sign language for the first time. He recalled that even his parents did not believe he was capable of learning a trade and his relatives, friends and neighbours treated him as though he was "beastly, imbecilic and insane". At the age of only nineteen, he escaped to Paris where he managed to earn a living as a bookbinder and paper-hanger. It was only eight years later that he finally learned how to sign. He was taught not in class but by the unschooled deaf servant of an actor at the Comédie-Italienne. Desloges was emphatic that the sign language which the abbé de l'Épée had developed already existed informally; it was "the natural language of the deaf, a "useful art" that the Parisian community of deaf laborers had established between themselves through "common sense and the company of their own kind". For a time Desloges was adopted by the Parisian intelligentia. who admired in him a noble savage who had formed his ideas exclusively through empirical observation and rigorous logic. He met with the celebrated secretary of the Académie des sciences, Condorcet and published essays in the Mercure de France and Journal encyclopédique. In the Salon de la correspondance a strange silent written debate was staged between Desloges and Saboureux de Fontenay. Later, like the deaf sculptor Deseine, Desloges became an enthusiastic supporter of the Revolution. In July 1789 he published an anonymous Letter to the electors of Paris from a deaf and mute French citizen in praise of the patriotic conduct of the French Guards. 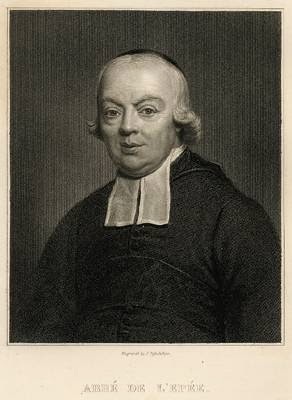 The conservative abbé de l'Épée in the Journal de Paris was at pains to point out that he did not know Desloges personally or share in his sentiments. It would appear, however, that, far from ushering in a new era of hope, the Revolution brought destitution for Desloges. In a manuscript letter of August 25 1790 addressed to the Keeper of the Seals he signs himself "Desloges, deaf and mute, good pauper of Bicêtre" and describes how "very cruel" circumstances had reduced him to living in that notorious institution. He had just sent an address to the National Assembly soliciting a school and hospice for the deaf and mute. As a result of his efforts on behalf of the Institution des Sourds-Muets, he was eventually awarded the sum of 300 livres by the Convention. 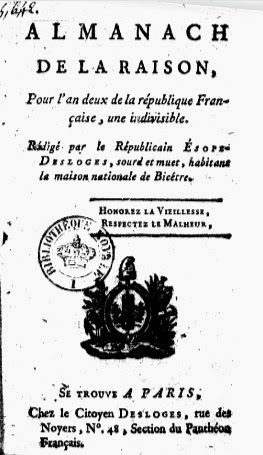 Desloges reappears again in the historical record only briefly in late 1793 (Year II) when, as "the republican Esope-Desloges, deaf and mute, inhabitant of Bicêtre", he published an Almanach de la raison dedicated to the Jacobins, "who are waging a courageous war against prejudices and superstition". His appeal to natural language now has a certain note of anti-intellectualism: he notes that he has left errors in the text, but has thereby given to youth "a idea of the natural religion of the honest man" who owed his education entirely to "nature". Sophia Rosenfeld, A Revolution in language: the problem of signs in late eighteenth-century France (2003), p.103-6, note, p.311. Renate Fischer, "Abbé de l' l'Épée and the living dictionary" p.13-26.